Christmas 2017: The Sweetest Festive Treats From Local Places! Home Food Christmas 2017: Sweet Treats You Can’t Miss This Festive Season! 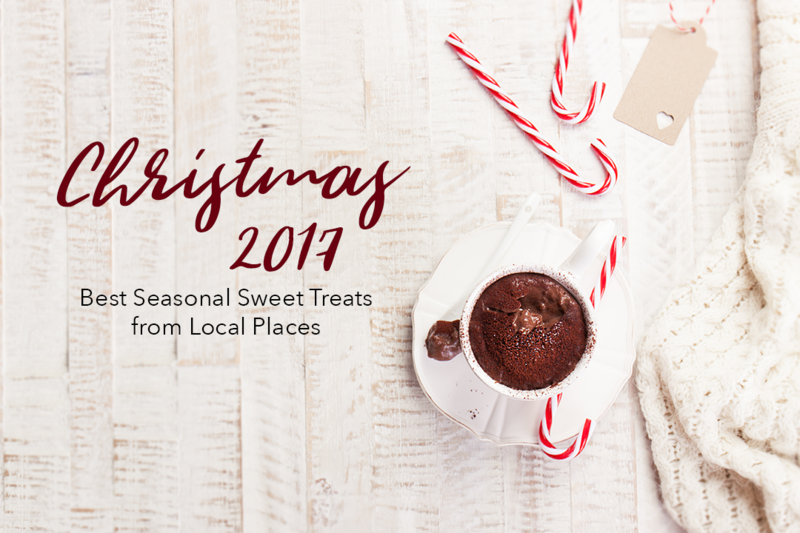 Christmas 2017 – The Sweetest Delights from Local Cafés, Restaurants, and Bakeries! Christmas is right around the corner, and there’s a festive mood all around us! More than the music, the fun friend gatherings, and the gifting, there’s one thing everyone looks forward to during the holiday season – food! And what Christmas party is complete without sweet treats? Here are 10 local places where you can get delectable delights for a merry and bright Christmas season! Sablé is a type of round shortbread biscuit that originated in France, and has a rich buttery flavour. And this Christmas, The Affogato Bar brings you a series of Christmas Sablés, which comes in 3 delightful flavours – Graviola (soursop bits paired with green tea), Earl Grey, and Noir (dark chocolate)! Two of the three Christmas Sablés also come in a set with their corresponding tea flavours. If you’ve got a friend who lives for afternoon tea, the Sablé and Tea Set is a great Christmas gift for them! The Affogato Bar’s Christmas Sablés are available in store, or online at the website. Nestled in the culturally-rich Katong district, Baba Chews is known for their unique take on Peranakan cuisine. This Christmas, Baba Chews has rolled out a plethora of holiday special menus, where your favourite Peranakan delights are given a festive touch! Dessert lovers will enjoy Baba Chews’ unique Yule Log Cakes, which draw inspirations from classic Nyonya desserts. Who would’ve thought that Chendol is so yummy in a cake form? The wonderful chefs at Baba Chews, of course! Baba Chews’ Yule Log Cakes are available as desserts in their Christmas special menu. Whole cakes are also available for preorders through phone calls or email. Part-vintage home store, part-cafe, Carpenter and Cook is an eclectic, charming establishment that sells unique home decor alongside baked goods and confectionery. If you fancy a Christmas dessert that’s a little off the beaten path and unusual, check out Carpenter and Cook’s Christmas Brandy Fruit Cake! Although fruit cake may incite polarising reactions from most, Carpenter and Cook’s version is simply delightful across the board. Soaked in brandy, their unique take on the Christmas dessert is just the right amount of fruity and nutty. For whole loaves, Carpenter and Cook’s Christmas Brandy Fruit Cake is available for preorders through phone calls or emails. Lola’s Cafe in Kovan is best known for their honest, down-to-earth brunch fare, with cozy and comforting vibes. This holiday season, the spotlight is on their desserts – in particular, their trio of special festive cakes! The trio consists of the White Chocolate Cheesecake, Dark Chocolate Hazelnut Log, and Milk Chocolate Blackforest Tart. Each of these decadent cakes are available as single portions, both in-house and for online order. If your loved one’s got a sweet tooth, Lola’s Cafe has got you covered in the gift department too! They’ve rolled out their pretty Christmas Gift Box Set, consisting of all 3 merry flavours! Is this not the sweetest gift ever? Individual slices are available in-house and for online order; box sets through online order only. Be sure to place your box set order 2 days in advance to avoid disappointment! Residents of sunny Singapore can only dream of a White Christmas – but gourmet patisserie Mad About Sucre swoops in this Christmas with a dreamlike confection! Meet Log Cake White Night, one of Mad About Sucre’s top-selling festive confections for this year’s holiday season. The snowy-looking confection features citrusy Yuzu and decadent white chocolate – and, like all of their creations, are baked from scratch with top-quality natural ingredients. A feast for the eyes and tastebuds, free of preservatives and artificial colourings! Preorder the Log Cake White Night and other decadent Christmas confections by Mad About Sucre via phone call or email. Give your Christmas party an extra-personal touch, with a cute Rudolph cake! Japanese-French style patisserie Nesuto holds weekly cake workshops for baking enthusiasts, and this festive season’s classes feature our favourite red-nosed reindeer! In the workshop, the fine folks at Nesuto will coach you through each step, from baking, to assembling, and decorating your very own Rudolph cake. At the end of the class, you’ll get to bring home your sweet, adorable creations too! Other awesome baking classes for the month of December includes the Unicorn Cake Workshop, and the Christmas Macaron Tower Workshop. Classes are available every Friday and Sunday. Sign up through DMs on Nesuto’s social media, or via email! Durian lovers, rejoice – NOM Bistro & Bakery’s got a festive treat for you in store! Revel in the sweet flavours of D24 durian in NOM’s seasonal favourite, the D24 Durain Rainbow Cake! Each cake is made with real D24 durian chunks, encased by a pretty rainbow cake exterior. Topping off the indulgent Durain Rainbow Log Cake are macarons in matching colours, nestled on a layer of whipped cream. Preorder the psychedelic D24 Durian Rainbow Log Cake via phone call, or their online ordering website! These Christmassy desserts by Non Entrée Desserts are almost too adorable to eat! Pictured here is the Cypress Star, a green tea-and-chestnut flavoured meringue tart, shaped like a little Christmas tree. Check out their Instagram for more festive treats, such as Candy Cane, a Swiss roll filled with Earl Grey Tea flavoured whipped cream and raspberry jam; or Christmas Ornament, a chocolate-and-cherry confection. Better yet – visit Non Entrée’s Rangoon Rd premises, and indulge in these festive creations, before it’s gone! Here’s a festive special that’s a little different from all the sweet treats and desserts featured in this list. Old Hen Coffee specialises in cold brew coffee, which comes in their signature beer bottles. Come this Christmas, Old Hen Coffee is bringing back their seasonal favourite – the Valrhona Dark Peppermint Cocoa! Indulge in the deep richness of the dark cocoa, while the soothing peppermint flavours evokes a merry mood within you. That it is a cold brew, makes it all the more refreshing for Singapore’s sweltering heat! The Valrhona Dark Peppermint Cocoa is available at both of Old Hen’s outlets – Coffee Bar and Kitchen. Christmas isn’t complete without gingerbread men! Boutique bakery Salt & Delight’s seasonal cakes feature these delightful little pastries as the centrepieces. From the lightly-spiced Gingerbread Cupcakes, to the decadent Chocolate Mulled Wine Cake, these festive confections are sure to bring joy to your heart and palate this Christmas! The adorable Gingerbread Cupcakes come in a box of 6, making it the perfect festive gift for friends or family! Salt & Delight’s Gingerbread Cupcakes and Chocolate Mulled Wine Cake are available for pre-orders via phone calls or email. ’Tis the season for great food, yummy sweet treats, and lots of jolly fun! Many of these seasonal delights require advanced ordering, so order ahead to avoid disappointment. Most importantly, we hope you’ll have a wonderful time with all your favourite people, as we cross over to a brand new year! Good food knows no seasons! Share this article with your friends, or check out more recommendations in our Food category! Previous article6 Unique Eats in Local Hawker Centres and Kopitiams! Next articleThese Pets Are The Proudest Parents Ever!